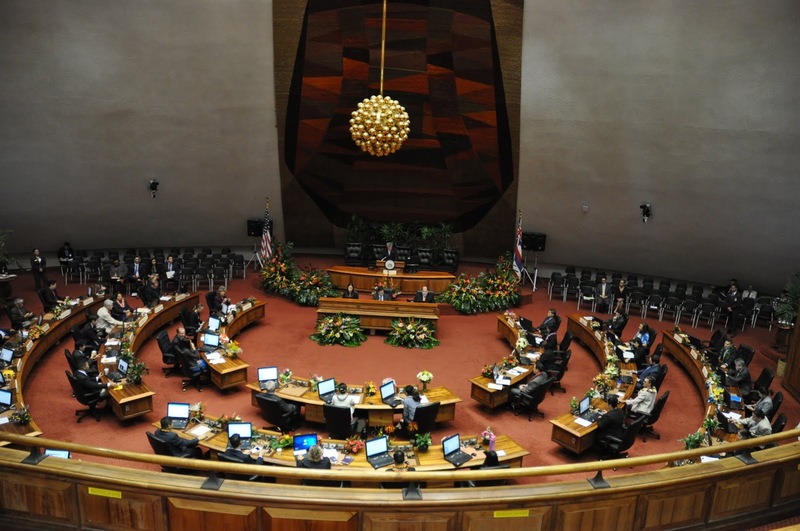 Honolulu, Hawaiʻi – The House of Representatives passed 197 bills on third reading today, moving them to the Senate for their consideration. The bills include measures on election reform, climate change and the environment, minimum wage, education, public safety, crime, taxes, and other important issues. HB709 HD1 Proposes an amendment to the Hawaiʻi State Constitution to allow the Legislature to enact laws regarding how recounts are conducted in an election. HB428 HD1 Requires an automatic recount of votes cast for a candidate or on a ballot question when the difference in the number of votes is equal to or less than 100 votes or 0.5 percent, whichever is greater. HB626 Requires that vacancies in the offices of United States Senator, State Senator, and State Representative to be filled by a special election. HB1248 HD1 Requires voting by mail for all elections statewide by the 2020 primary election, and establishes a limited number of voter service centers to receive personal delivery of mail-in ballots and offer same-day registration and voting. HB210 HD1 Provides ranked choice method of voting for all partisan primary elections, special elections, and nonpartisan general elections held in the state on or after January 1, 2020. HB627 HD1 Amends campaign finance law by requiring that candidate committee reports include independent expenditures in support or opposition of a clearly identified candidate, that the Campaign Spending Commission notify candidates of independent expenditures and publish the information on its website, and that noncandidate committees disclose all contributors for advertisements. 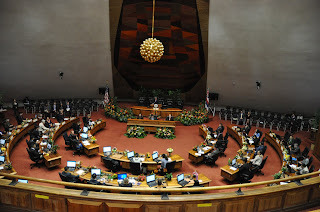 HB461 HD1 Requires the Hawaiʻi Climate Change Mitigation and Adaptation Commission to address the impacts of sea level rise by identifying critical public infrastructure in impacted areas, identifying priority areas that will be subject to high rates of coastal erosion, developing a sea level rise adaptation plan, and reporting to the Legislature before the 2021 Regular Session about how to move forward with concrete strategies for mitigation and adaptation. HB549 HD1 Requires new developments to plan for the impacts of projected sea level rise and prohibits development in areas significantly affected by projected sea level rise. HB765 HD1 Requires the incorporation of sea level rise projections in all new plans and updates to existing state plans generated under the Hawaiʻi State Planning Act. HB1487 HD1 Establishes the Honolulu shoreline climate protection pilot project to develop a plan to protect urban Honolulu from the acute impacts of sea level rise, floodwater, storms, and other impacts of a rapidly changing climate. HB1121 HD1 Requires the Commission on Water Resource Management to update the Hawaiʻi water plan by addressing issues including climate change and sea level rise to ensure protection and management of water resources. HB588 HD1 Requires the State Sustainability Coordinator of the Office of Planning to complete a holistic and comprehensive study and plan for green infrastructure opportunities in the State. HB855 HD1 Renames the Building Energy Efficiency Revolving Loan Fund as the Clean Energy Revolving Loan Fund and expands the fund's purpose to include a broader range of clean energy technologies. Transfers the fund's administration to the Hawaiʻi Green Infrastructure Authority. HB1585 HD1 Provides rebates for new electric vehicle charging systems or upgrades to existing electric vehicle charging systems. HB1170 HD2 Addresses cesspool pollution by establishing a waste management solution pilot project to examine and demonstrate new toilet and sewage treatment technologies. HB1548 HD1 Appropriates funds to study and combat rapid ʻōhiʻa death. HB1191 HD1 Increases minimum wage rates annually from January 1, 2020 through January 1, 2024, with lower minimum wage rates for employees who receive employer-sponsored health benefits. HB96 HD1 Authorizes each county to establish a minimum wage that is a higher wage than the state minimum wage. HB1275 HD1 Provides annual salary step increases and triennial longevity increases for public school teachers and educational officers who have completed a year's satisfactory service and comply with existing licensure and certification requirements. HB247 HD1 Appropriates funds for the Department of Education to install air conditioning in public schools that prioritize the project. HB251 HD1 Appropriates funds for laptop or tablet computers to be used by teachers and students for digital teaching and learning. HB703 HD1 Prohibits any person convicted of Operating a Vehicle Under the Influence of an Intoxicant or Habitually Operating a Vehicle Under the Influence of an Intoxicant from purchasing or publicly consuming alcohol for a probation period following sentencing or administrative license revocation. HB 1264 HD1 Authorizes the court to decree a forfeiture of an employee's retirement benefits if the employee is convicted of a felony related to the performance of the employee's job. HB508 HD1 Requires persons arrested for felony sexual offenses to provide a DNA sample, and provides for the destruction of DNA samples and expungement of a DNA database profile when appropriate. HB456 HD2 Requires the Director of Public Safety to develop policies and procedures to govern the use of force, including training and equipment, by deputy sheriffs, and requires less-than-lethal use of force training. HB1176 HD1 Authorizes law enforcement officers of the Department of Transportation to use electric guns while performing their duties, and requires the officers to be accredited by June 30, 2024, for the use of electric guns. HB476 HD1 Appropriates funds into to the Rental Housing Revolving Fund for the construction of low-income housing. HB1195 HD1 Establishes the Federal Furlough Loan Program to provide loans to eligible federal workers affected by the federal shutdown, and provides an emergency appropriation to carry out the purposes of the loan program. HB334 HD1 Expands the eligibility for state-funded individual development accounts to include households with income up to 100 percent of the area median income, and expands the allowable uses of account funds to include rental housing, transportation, and small business development. HB631 HD1 Authorizes each county to impose a surcharge on the transient accommodations tax, and repeals state distributions of the tax revenues to the counties. HB475 HD1 Disallows any deduction from state income taxes for the dividends paid by real estate investment trusts. HB18 HD1 Repeals statutory limitations on the time period in which a survivor of childhood sexual abuse may file suit. HB1343 HD1 Extends Hawaiʻi family leave to include care for grandchildren. HB467 HD1 Requires the Executive Office on Aging to include details on outcomes of the Kupuna Caregivers Program in its annual report to the Legislature, and to create a plan to offer core services and maximize the number of participants in the program. Changes the Kupuna Caregivers Program allocation cap to qualified caregivers. HB754 HD1 Regulates the use of electric foot scooters by giving those who ride the scooters the same duties and rights as bicycle riders, and prohibits anyone under eighteen from operating an electric foot scooter. The deadline for House bills to pass third reading in order to move to the Senate is March 7. Click here for a list of all 328 bills passed by the House of Representative so far this session.